The following green toys recommendations are based on our favorite product reviews from 2010. 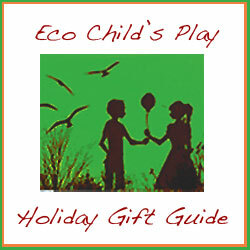 We hope it gives you some great ideas for your holiday gift giving, as well as helps you choose gifts for your children while considering their health (and the planet’s). Occasionally, we get sent a product we feel is truly green and truly adorable! EcoZoo backpacks by EcoGear are the real deal! PVC and Toxic Free, everything about these bags is right, all they way down to the tags. The only drawbacks are they are made in China, and the cotton could be organic. 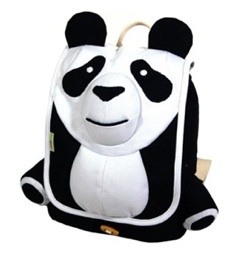 Seriously, these animal backpacks are so darn cute. My children are enamored with our panda. As you can imagine, we get sent a lot of baby clothes to review. I usually don’t get too excited about the clothes we are sent, but as soon as I opened the package from Nature Baby, I was in love. Nature Baby is a family business specialising in products which nurture both you, your baby and nature. Established in 1998 in New Zealand it began as quest for innovative products for our own family, we then found, that like us – many other parents wanted their children to grow up in a beautiful, non-toxic world. I especially love the Lambskin booties, and I so wish they would fit my adult feet! We were also sent an organic cotton long sleeve bodysuit, organic cotton drawstring pants, and an organicknotted beanie hat. Everything is of super high quality and super soft. These organic baby clothes will make your baby even harder to resist snuggling with as they are so sweet and cuddly. I so love Haba toys! These high quality wooden toys are always worth the money. Now that my children are getting older, I am especially enamored with the Master Builder Sets. Replicating ancient wonders of architecture, children really have to think when using these wooden blocks. 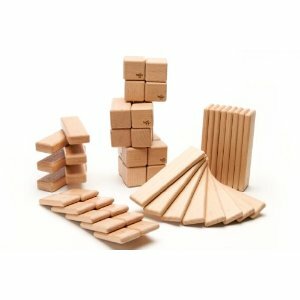 In addition, they can create their own unique structures with these unusual wooden pieces. One of my favorite Master Builder Sets is the Roman Coliseum, which some day I hope to visit in person. In classic Haba style, you can recreate the splendor of the Roman Coliseum! This block set allows you freedom in feats of architecture and engineering with unique pieces of the highest quality beech wood. 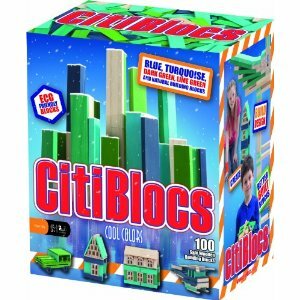 A great block set to diversify your current collection. Custom cut to form and fit together in fantastic construction combinations. Part of the Master Builder Block System, you’ll have all the tools you need to build as complicated or as simple a structure as you like. Not simply for young children, the Haba Master Builder System appeals to people of all ages. Mix block styles from Haba to make structures, villages, civilizations distinctively your own. 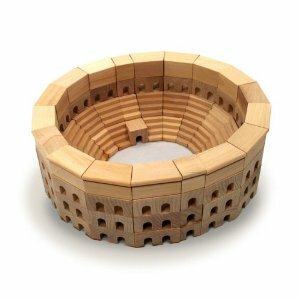 The Coliseum Set contains 110 blocks in 7 distinctive shapes. Tegu blocks are really cool! 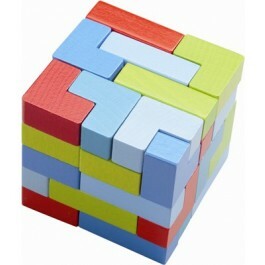 These high quality blocks feature magnets inside that take wooden block building to a whole new level. Tegu is truly a sustainable company that prides itself on being able to make 1,000 sets of blocks from a single tree! That’s pretty amazing, plus they plant over a 100 new trees for every tree they use. Given all these green company characteristics, I just wonder why they shipped our blocks wrapped in plastic bubble wrap. One thing I hate about packing lunches for school and work are the plastic containers and bags. Of course, I wash and reuse until they fall completely apart, but plastic, no matter how recycled in origin, gets gross over time. Stainless steel is a much more durable option. 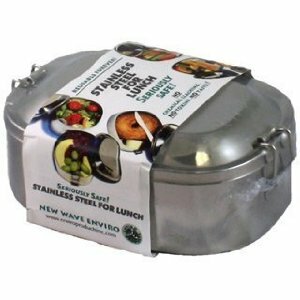 I have tried out a three tiered stainless steel lunch kit before, but I found it difficult to pack and sometimes hard for younger kids to manage. I like the individual containers much better. Like everything stainless steel, it is made in China. The history of the djembe originally from West Africa produces three distinct tones, deep bass tone when striking the center on the drumhead, mid tone played just of center, Rim shot played with fingers on edge of drumhead. Rhythm is the building block for all music making. Let’s make music. Although these drums are made from synthetic materials, unlike handmade drums, I am willing to sacrifice my natural toy ideology for a good, durable drum. The synthetic materials give these djembes “consistent vibrant tones” and make them easy to play. Of course, we have some natural drums in our home too. The EarthBall is inflatable and made from “New…Child Safe Phthalate-Free Material”. It is 16-inches in diameter, but what makes this ball really cool is that it glows in the dark. Created with NASA satellite photos, the cities of the world illuminate. The EarthBall is an amazing visual tool for teaching children about energy consumption, world population, light pollution, etc. Adults are just as fascinated as children by the EarthBall, and it comes with a Global Handbook including games and information. My son is a little helper. From the garden to the woodshed, he’s out there with us doing all of the chores of country living. We have bought several pairs of cotton work gloves in the past, but these gloves never fit right, get lost, aren’t like Mommy and Daddy’s, don’t last, are not very protective, etc. It seems only fair to give children real tools, like leather work gloves. Young children want to help you carry garden clippings, clear brush and weeds, and do other work in the yard. Sturdy, well–fitting leather gloves protect their hands and help them grip tools firmly. Might as well continue the working theme! This tool bench is my son’s absolutely favorite place to hang out when playing. Big building projects call for big workbenches and that’s the idea with My Professional Workshop. The 78-piece set includes an abundance of screws and wood pieces to construct things with the hammer, screwdriver, vice, and ruler. We’ve reviewed several toys by HaPe in the past, and all of them have been extremely well made and of high-quality. Every child’s art supply comes with the assurance that it is “non-toxic”, but I have often questioned how true this statement really is; however, I don’t question the toxicity of Glob It On Paints! This may be one of the coolest products we have reviewed in a long time. Made from organic plant extracts, Glob comes in powder form that you mix with cold water to the desired consistency. Finally, eco-friendly paints made from natural ingredients. Created with a focus on sustainability, these water-based paints and pigments are biodegradable. GLOB™ is made from colors found in nature. Our botanically crafted products are colored by fruits, vegetables, flowers and spices. The vibrant pigments in GLOB™ have been used by different cultures throughout the ages in artists’ paints and body products. Using cosmetic and food grade ingredients, our products are truly non-toxic. GLOB™ paints are unmatched in quality and environmental synergy.
. Mixed up paint needs to be stored in the refrigerator, because they are truly all natural, but you can easily just mix up a little at a time based upon your needs. 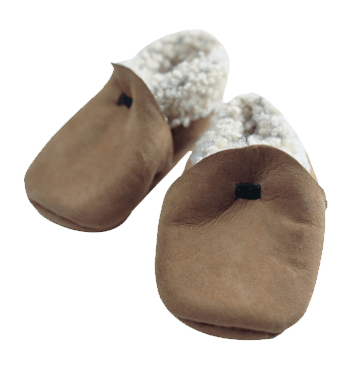 Available from Essere Organics, this adorable collection of organic plush is truly natural. Made from certified organic cotton and an eco-friendly natural dye process, these are toys you will not worry about harming your child, besides they are truly delightful. Made by miYim, I really like the organic FairyTale knit collection. Fairytale Knit Collection characters are soft and naturally colored with embroidered details and natural unprocessed/unbleached cotton filling. Three distinctive characters create the Fariytale knit collection. Pick up your favorite: Baby Victoria Bunny, Baby George Monkey, and Baby Abigail Bear. It’s all in the ingredients! The miYim process is the secret to creating our charming colors. When woven, the cotton is allowed to retain its natural form untreated, unbleached, and unprocessed. It is dyed using only all-natural ingredients derived from nature’s plants and minerals. miYim is water-washed, clean and pure combined to form the world’s first all-natural children’s toy. Please check out our past holiday gift guides for even more ideas!